Look familiar? 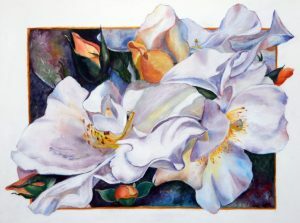 The cover of ASHA’s newly released State of Seniors Housing Report features “Magnolias,” a beautiful oil painting by Stella Szemela, resident of The Fountains at Boca Ciega Bay. You may remember seeing it as February’s featured artwork in Expressions 2018. And that’s not all. Inside the report, you will see art by other Watermark artists including Sarah Guerrero of The Watermark at Beverly Hills, Jeanne Kleinschmidt of The Fountains at Canterbury, Barbara Curtis of The Watermark at Logan Square and Vivian Jerothe of The Watermark at Trinity, also featured artists in Expressions 2018. We appreciate ASHA for embracing the universal message that it’s never too late to express yourself through art. Watermark is proud to celebrate active aging and the arts for 19 years running. Seen by every major senior living provider and investor in the world, ASHA’s State of Seniors’ Housing report is a prime vehicle to reinforce Watermark’s commitment to creating extraordinary and innovative communities where people thrive. Thanks to our outstanding Community Life associates who submit professionally photographed images of their residents’ art submissions year after year, ASHA knows it can always count on Watermark to provide high quality images of original artwork by our residents. Watch for Expressions 2019 coming your way in November!